Jill Stein’s multi-state presidential recount was unprecedented. The idea originated from a group of computer scientists represented by attorney John Bonifaz, who after analyzing the U.S. computerized voting system found it to be vulnerable to hacking and manipulation. Social scientists and statisticians deemed some of the 2016 election results to be improbable. Election integrity volunteers and attorneys stepped up to help sort it out. Jill Stein, Green Party presidential candidate, agreed to ask for recounts in three states: Wisconsin, Michigan and Pennsylvania. The donation page went online the afternoon before Thanksgiving. The recount was quickly financed in a few weeks by 150,000 small donors at the grassroots level across the political spectrum. But if you were watching Fox News or reading Facebook during the recount you would think Stein, with a suspicious and nefarious agenda, was at best working undercover for the Clinton campaign or at worst, involved in a political payola campaign scam to enrich herself. In reality, she was using the U.S. State Department and U.S. Agency on International Development (USAID) standards of election integrity that every democratic country on the planet is held to – except the United States. That standard is simple: If there is a significant mismatch between exit poll numbers and official vote totals, it is assumed something is amiss. In the case of this November’s presidential election, 13 states had exit poll-vote total mismatches that raised red flags with discrepancies that were far outside the margin of error. Twelve went for Trump and one for Clinton. In the Wisconsin, Pennsylvania, North Carolina and Florida exit polls, Clinton was ahead but Trump won the official vote count. In fact, in 24 out of 28 states there was a shift to Trump. This wouldn’t happen except once in every 52,440 presidential elections. Statisticians predict that this should be more evenly divided between the two candidates. All three states chosen for the recount admitted errors in their official vote counts, all in Trump’s favor. 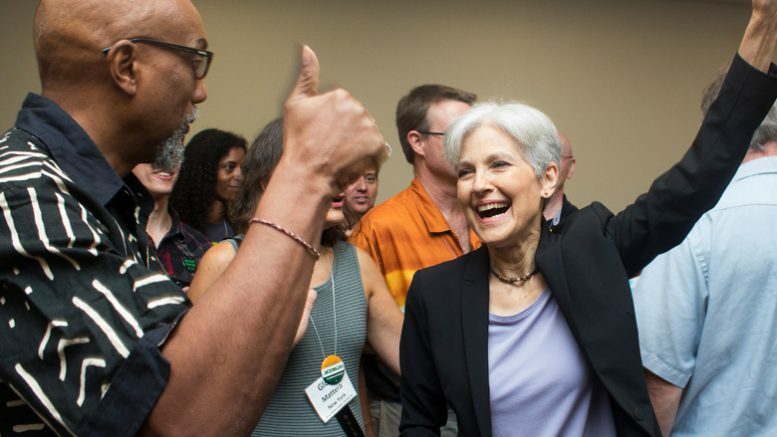 Stein raised $7.3 million for the recount, all funds being segregated in a special bank account overseen by the Federal Elections Commission to be spent only on the recount. Her costs are estimated to be $7.4 million. Bonifaz and the computer scientist group also approached Clinton to challenge the suspicious election results, but she declined to act. Why recount Wisconsin? Exit poll numbers showed Hillary Clinton with 48.2 percent to Donald Trump’s 44.3 percent in Wisconsin. These numbers did not match the vote totals: Trump – 47.9, Clinton – 46.9. Given the difference between the exit poll numbers of 44.3 and Trump receiving 47.8 percent of the vote, the likelihood of this occurring is only once in every 614 elections. Wisconsin voting conditions: Wisconsin voted approximately five percent on paper ballots, 10 percent on Direct Recording Electronic (DRE) computer voting machines, and 85 percent on paper Scantron ballots. The Wisconsin Elections Commission (WEC) administers all of the state’s elections. Wisconsin is one of the few states to have same-day voter registration. Under Wisconsin law, voting machine vendors are required to put their secret source code used to program their machines and tabulators into escrow. There is no evidence this was done, dating back to 2005. Election integrity activist John Brakey who was on the ground in Wisconsin confirmed the use of modems and SIM cards in ES&S Optiscan voting machines. ES&S never tried to hide this and included it in their marketing materials for the DS200 model. .
Stein’s attorneys also found that “Wisconsin has no rules requiring private vendors to protect their computers from cyberattacks.” Also, “No national cybersecurity standards for these computers exist,” they wrote in a letter to U.S. Attorney General Loretta Lynch. Shockingly, Haas admitted that USB drives from private vendors who are contracted to run the elections are allowed to be “inserted into the voting machine before the election.” This makes the voting machines easily vulnerable to malware attacks. What happened in the recount: The Stein campaign was forced to pay $3.5 million to conduct the recount. Wisconsin “recounted” the vote in all 72 counties. Approximately 51 percent of the state’s vote was counted by hand, but 49 percent were counted by running the ballots through the same machines that may have miscounted them on election night. In Milwaukee County, Wisconsin’s largest and most racially and ethnically diverse county, there was no hand count. Election observers watched the hand recount and had the opportunity to object if they saw any irregularities, but where there was no hand count, they simply observed ballots running through machines. The Stein campaign sued the WEC to force a hand recount. Dane County Circuit Judge Valerie Bailey-Rihn found that there was no clear and convincing evidence of fraud, hence she interpreted the law to allow counties to conduct a machine recount if they chose. She conceded that a hand-counted recount was clearly preferable but there was no legal basis to force counties to conduct a hand recount. Two pro-Trump super PACs – the Great America PAC and Stop Hillary PAC – filed a federal lawsuit in an attempt to stop the recount, but Federal Judge James Petersen refused. On election night, Trump led by 27,000 votes. Trump’s victory was eventually certified in Wisconsin leading by 22,000 votes. As we go to press, the Stein litigation team is still trying to obtain the source code used to program the voting machines in Wisconsin. Why recount Michigan: The Stein campaign paid $973,250 for the Michigan recount. Michigan was a toss-up state with both Trump and Clinton having 46.8 percent of the exit polls. Trump ended up with 10,704 more votes than Clinton. But, there was a major problem with “undervotes.” This made the state an ideal recount target. On 75,335 ballots in the presidential election, constituting 1.5 percent of all Michigan votes, there was no vote for president. Michigan’s voting conditions: Michigan voters cast paper Scantron ballots counted by machines. The state emergency manager had denied Detroit’s request to spend money on newer voting machines. All of Michigan’s vote tabulators are at least a decade old, according to the Associated Press. This is the same emergency management law that forced Flint residents to drink from a lead poisoned river to save money. What happened in the recount: The recount effort revealed serious operating problems with Michigan’s voting machines. In Detroit, at least 87 voting machines malfunctioned on Election Day, according to city election officials. Numerous precincts in Detroit also lost their pollbooks – the only record of how many people signed in to vote. Other problems included improperly sealed and transported ballot boxes. A Detroit precinct reported to contain 307 ballots could only produce 52. Nearly a quarter of all ballots in Wayne County were not properly handled resulting in discrepancies between the number of ballots in the ballot box and the total ballots issued. Detroit election officials also reported finding numerous broken security seals on the bags containing ballots and voting material. Under a 1954 law, 610 of the county’s precincts could not be counted because of the discrepancy between the pollbooks and number of ballots issued and counted, 392 of them in Detroit. As a result of mismatched numbers and broken security seals, 59 percent of Detroit precincts could not be recounted. Approximately 11 percent of all the precincts counted statewide showed documented irregularities. In a letter to U.S. Attorney General Lynch, Stein’s attorney Jonathan Abady pointed out that the number was much higher in low-income counties like Branch where 27 percent of the precincts showed irregularities. There was an all-out Republican blitz to stop the recount from happening, including legal action. State and federal courts blocked Stein’s recount with two-thirds of the vote uncounted. Michigan Attorney General Bill Schuette led the charge to shut it down. At the time of Schuette’s actions, the recount was revealing irregularities. Federal Judge Mark Goldsmith initially allowed the recount to go forward but then reversed himself after Schuette and Michigan courts, including the state Supreme Court, ruled in favor of stopping it. The Michigan Supreme Court declined to hear an appeal by a 3-2 vote with two recusals. Chief Justice Robert Young and Justice Joan Larsen recused themselves because they were on President-elect Trump’s short list to be nominated for the U.S. Supreme Court. Before Judge Goldsmith halted the recount, 2725 of Michigan’s 7786 precincts, roughly a third, were recounted. In the Stein recount, more than 1600 votes were discovered and recorded that had not been counted the first time. Michigan Secretary of State Ruth Johnson has, however, announced plans to audit 20 of Detroit area polling places. Why recount Pennsylvania: Pennsylvania’s exit polls reported Clinton with 50.5 percent and Trump with 46.1 percent. The election night tally showed Clinton leading Trump by 1.2 percent instead of losing by 4.4 percent. Clinton’s 47.6 percent of the Pennsylvania vote in the election night compared to the exit polls of 50.5 percent would happen once every 85 presidential elections. The state voluntarily removed 27,000 erroneous votes for Trump just prior to the recount, The primary reason Pennsylvania was recounted was to take a close forensic look at the electronic voting machines, since the state is not designed to be recounted. Pennsylvania’s voting conditions: More than 85 percent of Pennsylvania voters voted on non-verifiable computer machines with no paper to recount. Pennsylvania’s state and county governments had not allocated the funds for auditable machines. Of the voting machines, 30 percent were the notorious ES&S iVotronics, determined to be easily tampered with by Ohio Secretary of State Jennifer Brunner’s famous Everest Study. Additionally, 29 percent of Pennsylvania voted with the even worse Danaher Shouptronic voting machines, one of the earliest machines dating back to the 1980s. Voters also reported never receiving requested absentee ballots in time to cast them. In Montgomery County an estimated 70,000 people risked being disenfranchised before a judge ordered an extension to absentee voting. Many voters reported issues with the DRE machines inaccurately recording their vote. In Montgomery County, out of nearly 450,000 ballots cast, more than 4000 recorded no vote for President. Alex Halderman, a University of Michigan computer science professor, testified that the Pennsylvania computer voting machines were vulnerable to hacking by both transferring infected files from one machine to another through ordinary flash drives or by someone physically tampering with computer chips. Halderman told the court that “Putting myself in the role of attacker, with all its vulnerabilities, I would hack Pennsylvania.” Halderman is known for successfully hacking into the Washington DC voting system for a demonstration after District election officials challenged anyone to try hacking in. U.S. District Court Judge Paul Diamond stated that suspicion of a hacked election in the Quaker State “borders on the irrational.” In prohibiting a recount, Diamond held that there was “…no credible evidence that any ‘hack’ occurred and compelling evidence that Pennsylvania’s voting system was not in any way compromised.” Diamond’s ruling came after the Washington Post claimed that a secret CIA report found the Russians interfering in the U.S election electronically in order to hurt Clinton and aid Trump. The Allegheny County Elections Commission and a state common pleas judge rejected Stein’s request to examine the voting machines that lacked a paper trail. Allegheny County is the second most populous county in the state. Common Pleas Senior Judge Joseph M. James, in a classic Catch-22, ruled that since Stein lacked evidence of voting irregularities, she couldn’t examine the electronic voting machines for irregularities. Jill Stein stated the purpose of the recount: “Despite overwhelming evidence and consensus from cyber-security and computer science experts that our election system is vulnerable to hacking, manipulation, malfunction and human error, the political establishment in Washington has dismissed the need for comprehensive recounts of the 2016 election. Concerns about the security and accuracy of our election system extend into the realm of human and machine error, where there is already evidence before our eyes of widespread machine failure. We must get rid of tamper- and error-prone electronic voting machines and work toward a verifiable paper ballot system, which has long been central to the Green Party’s democracy platform. Bob Fitrakis, Ohio Green Party Co-Chair and the Federal Elections Commissioner in Jill Stein’s Shadow Cabinet served as legal counsel for Jill Stein’s 2016 recount campaign.